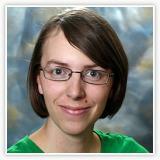 Dr. Van Laerhoven is a postdoctoral fellow at UBC. She gained her PhD from the Department of Planetary Sciences at the University of Arizona in May 2014. Christa has a B.Sc. from UBC in Physics and Astronomy (Honours) and am an ex-president of the UBC Physics Society. Christa is an OSIRIS-REx Ambassador and a panelist on reddit.com's AskScience. Dr. Van Laerhoven is interested in orbital dynamics in general and that of multi-planet extra-solar systems in particular.